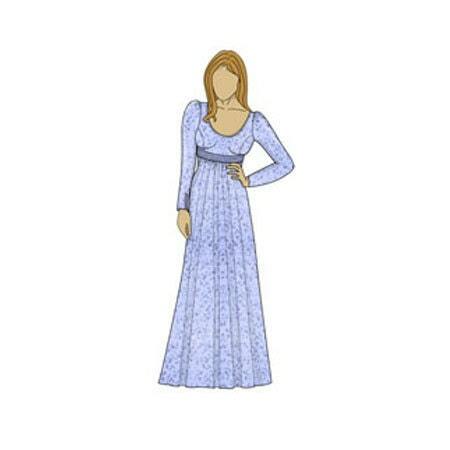 The regency costume is a full length fully lined dress. The neck line is a deep scoop neck, which is typical of the period; however the dress is not historically accurate. It features an empire waist line, with button fastenings down the back of the dress and the sleeves. The sash is separate to the dress but could easily be attached as a permanent feature. This dress will require an intermediate skill level of sewing, and an understanding of pattern markings. 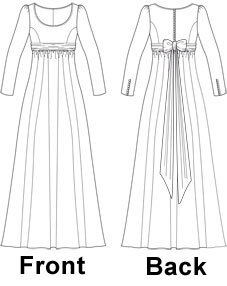 Full sewing instructions are included as well as additional instructions on making rouleau loops for the buttons and piping for the neckline (the piping is an optional feature that could be left off).